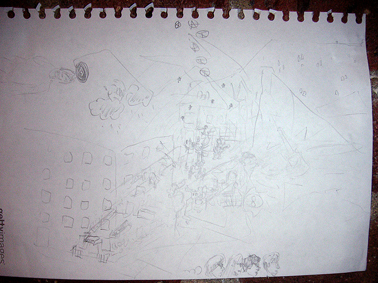 The two drawings (one abstract, the other with figures in a landscape with an underground cavern) which had been placed on the outer eastern wall the day before were placed on the floor. 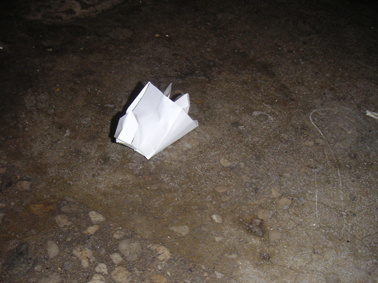 The small model of a house which had been on the floor by the western wall had been demolished due to someone stepping on it. 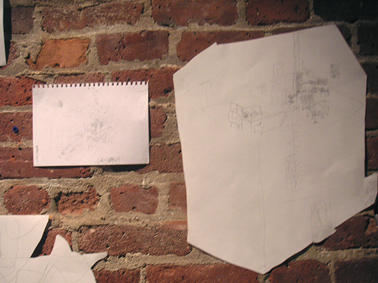 Two drawings were made at the Sound Fix record store (also situated in Williamsburg). One of the drawings depicted two bands performing in the store's cafe. 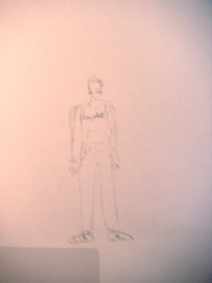 The other drawing was of a figure. 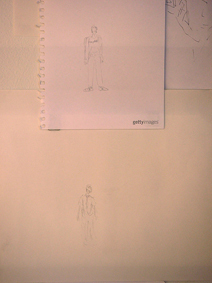 These drawings were taken into the gallery and hung on the walls: the drawing of the bands being placed on the inner eastern wall to the left of the cut-out drawing of the rehearsal space, and the drawing of the figure being placed on the edge of the wall upon which were already several drawings of similar figures.